Different people have different preferences when it comes to real estate. Some people prefer a house which is located on the quieter side of the town, while some people prefer homes which are on the busier side. Some people prefer large houses because they have a large family and then some just love big houses for the space. Whereas, some people are comfortable in a cute and small space. So before buying a house, what should matter more? 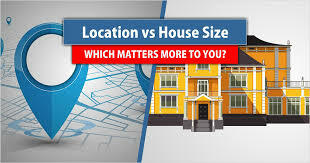 How big or small the house is, or where it is located? Both of these factors are necessary when it comes to buying a house but among these two options, what you may choose, depends on your own needs. Many people wait for the right time to start a family. That right time may be when they are able to afford a bigger house. If people are planning to start or grow a family, then they are going to need a bigger house. The location might not be ideal here. However, they will get a house which will fit their big or small family. There comes a time in people’s lives when they have to make certain changes to their lifestyle. This is especially true for people who have 3 or more children. When they see that their children are growing up and living in a two-bedroom house is not ideal anymore, they will need to move to a house that is bigger. They might also look for schools and shopping close by. People may not notice it until they see the empty rooms in their houses, but sometimes they need smaller houses. For example, children have finally reached the age where they need to leave their house to go to college for a few years. Then there is no point in keeping a house that has four bedrooms. After all, maintenance is very expensive too. A beautiful, two bedroom house would do perfectly well. If the owners buy a home with the intention that they are going to rent it out, then location matters. After all, it is an investment for them, and they want to choose a house that will profit them the most. Since many people prefer nice locations, they would be willing to pay a higher rent for it. The daily commute can be a problem for people if they live in a busy city. Regardless of whether they have a car or they travel through other means. They are bound to get caught up in the traffic. Interested buyers who are looking for a way out of this traffic problem may consider getting a house that is located near to their workplace. Sure, finding such a house would be time-consuming and may cost a bit, but at least they will reach their workplace in time. Once again, buying a house will be an investment for people who are planning to sell a home after living in it for a while. They want to get a healthy profit and to make sure the resale value of the house is strong, and then they might need to consider the location of the house. If you are interested in getting more information about home prices in your area, or possibly buying or selling a home, we recommend you consult with a professional Realtor local to the area. In today’s world, real estate is readily available. That doesn’t mean, however, that every house will come equipped with exactly everything the buyer wants. The good news is that this guide for first-time home buyers can help them find a home and then change it to suit all of their desires…no matter how crazy those desires may be. In fact, more and more people are equipping their homes with all kinds of interesting and creative additions to truly make them their own. It is not at all uncommon for a home to come equipped with a swimming pool. In fact, a pool can be a real bonus when attempting to sell a home. And, while most swimming pools are on the outside of a home, some luxury homeowners have taken to adding them indoors. They will take a whole room, give it proper walls and flooring, and then have a large indoor pool, often heated, put in. While this definitely isn’t a cheap undertaking, it’s a great way to get in exercise year-round and to swim in complete privacy! Many people have treadmills and other exercise equipment in their homes. However, it is becoming increasingly popular to devote an entire room or rooms to home fitness. Homeowners can line the walls with mirrors and put in a ballet barre to create a dance studio feel. Or, they can equip the room with state-of-the-art fitness equipment. Indoor yoga studios are popular as well. Some people may even wish to equip their gyms with lots of floor space to host indoor exercise classes. The possibilities are truly endless for today’s homeowners. For those who love the nightlife but who hate the crowds and hassle involved in going out on the town, a home bar is a perfect solution. Homeowners can change any large room into a bar. Creative use of counters and a fully-stocked liquor cabinet help add to the atmosphere. Pool tables and jukeboxes are also a fun way to liven up a home bar. Once the room is complete, all the homeowner has to do is invite over favorite friends and then relax and enjoy the feel of going out on the town…without actually going anywhere. Who doesn’t like to feel beautiful? Homeowners who truly cherish pampering themselves have been known to add in full spas to their homes. These might include stations for manicures and pedicures, massage tables, and comfortable lounging seats for getting facial treatments. Of course, all of this requires hiring staff to come in and do the pampering, but it’s definitely worth it to relax and unwind in the comfort of one’s own home. While not everyone is going to get quite as extravagant as the examples presented here, everyone does deserve to make their home a dream home. So, when looking at homes, don’t be afraid to get creative and think outside the box. Also, remember that you have the power to change any room into something totally new and different, so dream big! People occasionally sell their property to prospective buyers who are looking to own new properties in a specific geographical area. However, the selling cycle has proven to be a tedious process that may cost much time and money while still find it difficult to get a buyer. Home sellers have resulted in the services of a realtor who will act on their behalf on the whole process until it is completed. However, it is required that you pay a higher commission to your agent so that your home can be sold faster. The following are some of the reasons justifying higher commissions to your property seller. Before any home can be sold, an appraisal of the whole property must be done to ascertain the actual market value. This is usually done to prevent a situation where you might have formulated a selling price that is below market value leading you to losses or an amount that is higher than the market price which could cause difficulties in getting a buyer. With home prices on the rise across the U.S., your agent will evaluate a fair price in consultation with property appraisers. Within a short period of time, he or she will use their extensive network and your home will soon be listed for sale. A highly motivated realtor will take the professional photos for your homes, including all the sides and the flower gardens so that he can portray your property in excellent condition as compared to other properties for sale in the same region. Moreover, the photos will be taken in a 3D so that potential buyers can have a clear picture of your house. The seller will be working hard to ensure that the house attracts buyers within a short period so that he or she can start enjoying the higher commission that he will receive after the sale of the property. It is essential for you to learn that the real estate agent has a large list of other homes they are selling on behalf of other people. The law of nature will apply in this scenario such that the person who pays a higher commission gets added advantages such as giving your home a priority. Agents will take buyers to your house first before they can take them to other properties on their list. They will tend to act as if your home is one of the best properties they have by giving it the publicity it deserves. It will also be included in the ‘first moving’ list. Home selling agents have a large network with other professionals working in the same or related industries. They also have the contacts of those people who want to buy a home. In any chance you promise to give a higher commission, they will contact home buying agents and any other person who wants to buy a home such that your property will attract huge attention in a shorter period. Among the agents and people contacted, a prospective buyer could emerge and offer a bid that is consistent with your property valuation. You could end up selling your estate in a span of a few weeks. It is in the public domain that people tend to sell those properties that they are not using or when they want to move to another location. This means that the house for sale might not be in the right conditions such as untrimmed grass, broken parts not repaired or replaced, and bad maintenance of the overall property. A real estate agent who has been promised higher commission will conduct property face lifting activities such as painting, trimming grass lawns, and repairing broken parts of the home. He or She will ensure that your house captures the imagination of prospective buyers and in no time, your home will get a new suitor. Research studies have shown that well-maintained properties are likely to reach buyers at a shorter period as compared to poorly maintained properties. Your agent must find out potential buyers for your property in the market where many people are selling their properties. This means that only an aggressive marketing strategy can be used to find a buyer within a short period. A seller who will get a higher compensation for selling the home will use all the possible marketing channels to ensure that the property receives a buyer within a short time. He or She will use his company website, social media platforms, and can even go further to higher the services of mainstream media to ensure that the property gets a buyer within the shortest time possible. Paying higher commission encourages your agent to be aggressive in advertising and marketing your home. Negotiating the best price of the property has been known to be one of the factors that cause home sellers to stay for more extended periods before their properties get a buyer. The prospective buyer is focused on getting the property at the lowest price possible while you are bargaining for the best price of your property. This might take ages unless you chose to pay your agent a good commission. Once the person selling your property is aware that they will receive a proportion of the amount the property will get, he or she will conduct a speedy process that ensures you get a good return for your property and there for gets a higher commission. This is the final stage that focuses on transferring the property to the potential buyer. At this stage, prices have already been agreed, and the buyer is required to deposit money in the seller’s account pending the transfer of the property. However, this is a legal process that is very tiresome and time-consuming, especially in situations where the concerned parties don’t have a legal background in property transfer. However, an agent who has been paid higher commissions is aware of attorneys who can aid in property transfer because they work in the same industry. He will need to call him, and the deal will be concluded seamlessly within a short period and without challenges. A real estate agent has witnessed thousands of property transfer which means that he has the necessary knowledge and experience in transferring your property to the new owner immediately. You might find it hard to pay a property agent higher commission because you think he has no part to play in the sale of your property. Some people have even gone further to sell their homes so that they can save the commission that would have been paid to the agent. They have ended up staying with their properties for larger periods without finding a buyer, what has caused their properties to reduce in value. It is necessary to pay your property agent higher commission if you want your home to be sold within a short period.